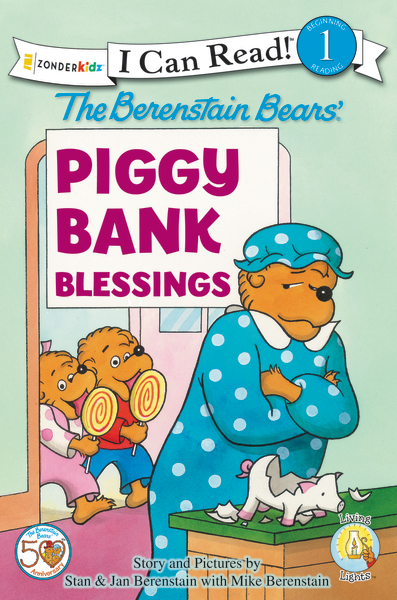 Mama Bear decides to instill the importance of saving money to her cubs in THE BERENSTAIN BEARS’ PIGGYBANK BLESSINGS (Zonderkidz; April 2013; $3.99). With their very own piggy bank, Brother and Sister begin to collect nickels, dimes, pennies and even dollars hoping to save for something special. But will the cubs heed Mama’s advice and spend their money wisely? Check out this picture and see what you think? Aren't those cubs so much like us? Will they use their savings for something foolish or spend it wisely? I love how Mama stays the same through the years, that time hasn't recreated her. She is such a matronly figure with her blue with white polka dot dress and cap. If there was a contest with showing us this outfit I wonder how many people would immediately know it is from Mama bear? "Save money for special stuff. Like special toys that Mommy doesn't want to get." This is a great beginner reader for your student to dive into this summer! Check out my giveaway for this and one other Berenstain Bear Easy Reader HERE!